Eastlake Football Booster Club in El Paso Horizon City Texas Eastlake Football Booster Club in El Paso, TX Home of the Falcons! 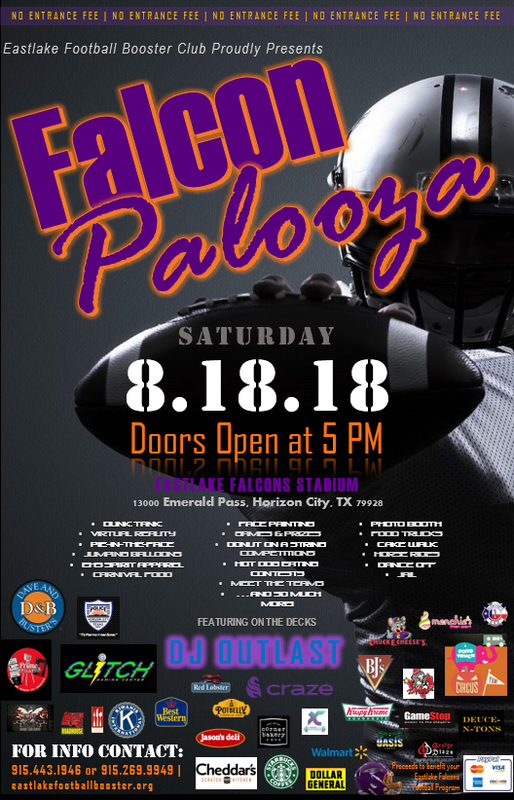 Welcome everyone to the Eastlake Football Booster Club's First Annual FALCONPALOOZA!!! We have tons of excitement in-store for you, including Virtual Reality provided by Glitch Gaming, a dunk tank for a chance to dunk your favorite principals, a pie in the face game, hot dog eating contests, donut-on-a-string contests, Dave and Buster's Street Crew, Food Trucks, and so much more. All proceeds from this event go to support our Eastlake Falcons Football Club. Game tickets will be sold at the door. This event is open to the public and all ages a welcome. Fun for the whole family!